The comment “it isn’t anything new” seems to be negative for many readers. No, it’s not. To be honest, almost 90% of the releases you can think of are breeds of anything, but it doesn’t mean that they’re not good. An example: compare METALLICA and MEGADETH, and you see the same musical genre, but different approaches are used (and none of them created Thrash Metal, but EXODUS is the one who started it). That’s what it means to say that the Power Metal quintet BLACK MAJESTY, from Australia, is releasing their very good latest album, “Children of the Abyss”. It’s just that old and good traditional form of melodic and technical Power Metal used by German bands as HELLOWEEN and GAMMA RAY. But these guys know how to create excellent hooking musical arrangements and charming choruses. Of course, it’s nothing that we didn’t heard before somewhere else, but how this album is truly very good. It glues in our ears! It’s their seventh album so it demanded a good producer. And the one they choose is Roland Grapow (from MASTERPLAN), who gave them a first class insight on the quality. Of course they sound heavy and with a raw aggressive touch, what make them different from those who want the things as clean as possible (and that sometimes sacrifices the musical weight for that). Everything works in a very good way, indeed. Musically, it’s an album that every fan of this genre will buy. And “Dragons Unite” (a fast song with excellent melodies and charming chorus, what shows how the vocals are truly very good), the catchy and heavy tempos “Something’s Goin On” (yes, the bass guitar and drums are doing a good and heavy work), the sharp harmonies and grasping speed of “Children of the Abyss” (excellent guitar riffs and solos), the climatic tempo changes of “Hideaway” (very good keyboards parts filling the spaces) and on “So Lonely”, and the fire dart riffs of “Reach Into Darkness” can be pointed as the album’s finest moments. But hear it entirely, you’ll love the experience. 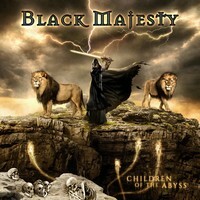 BLACK MAJESTY is really a very good band, and “Children of the Abyss” can put them in a better place on the world scene!